Arno Geiger’s father was never an easy man to know. Born into a farming family in Austria and conscripted into World War Two as a seventeen-year-old “schoolboy soldier,” he was later reticent about the past. When he started to change, Arno assumed it was due to the effects of aging and the breakup of a thirty-year marriage. But it turned out to be more than that. As Arno Geiger writes in this heartbreaking and insightful memoir of his father’s later years, “Alzheimer’s is an illness that, like everything of significance, tells us about a lot more than just itself. Human characteristics and society’s mores are enlarged by the illness as if in a magnifying glass. The world is confusing to all of us, and when you look at it with a clear eye you see that the difference between the healthy and the sick is simply the degree to which they are able to conceal the confusion on the surface.” Knowing that his father won’t ask for help, Arno sets out on a journey to get to know his father at last. Arno remains at his side, listens to his words that are often full of wonderful, unexpected poetry, and discovers that despite everything, his father has not lost his wit, charm, and self-assurance. Awash with light, full of life and surprising insights, and often very funny, The Old King In His Exile is a wonderfully affecting story that will offer solace to anyone who has struggled with losing an aging loved one. Arno Geiger grew up in the village of Wolfurt near Bregenz, Austria. He studied German studies, ancient history and comparative literature at the Universities of Innsbruck and Vienna. He has worked as a freelance writer since 1993. From 1986 to 2002, he also worked as a technician at the annual Bregenzer Festspiele summer opera festival. In October 2005, he was the recipient of the first Deutscher Buchpreis literature prize (awarded by the booksellers' association of Germany) for his novel Es geht uns gut. Geiger lives in Wolfurt and Vienna. Stefan Tobler founded his celebrated publishing house, And Other Stories, out of frustration at the great books not being published in English. With English and Swiss parents, he was born in the Amazon. After his first degree, he moved to Dresden for some years. He later did an MA and PhD at UEA, Norwich. He translates from Portuguese and German. His translations include the 2015 Oxford-Weidenfeld Translation Prize shortlisted Água Viva by Clarice Lispector, A Cup of Rage by Raduan Nassar (Penguin Modern Classics), the poetry collection Silence River by Antônio Moura (Arc) and Rodrigo de Souza Leão’s All Dogs are Blue. He reads French and Spanish too. He’s on Twitter @stefantobler. "Clear-eyed and lyrical . . . Arno Geiger's memoir is a gift to the very many of us who love someone with Alzheimer's disease. The author's message is one of humble gratitude that this debilitating disease has not entirely extinguished his father's warmth and kindness nor the quiet dignity of this exiled king. 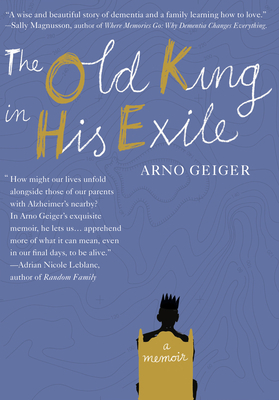 "A delightful memoir of dementia sounds impossible until you read The Old King In His Exile . . . Having sold a million copies internationally, it is now available in English thanks to this winning translation . . . While this is a rigorously unsentimental portrait, Geiger also shows that the cruelty of Alzheimer's can 'shine a light on much beyond itself,' from family dynamics to mortality and the nature of happiness . . . A book that will warm you right through . . . Four out of five stars." "How do we keep one another's company? How might our lives unfold alongside those of our parents with Alzheimer's nearby? In Arno Geiger's exquisite memoir, he lets us into the private and sometimes sacred spaces he found in the company of his father—a relationship nurtured by his own willingness to share a mutual solitude, and to visit those places where his father's spirit was broken and where it thrived. The tender stories in The Old King in His Exile hold the quiet love between these men, and invite the reader to apprehend more of what it can mean, even in our final days, to be alive." "[The Old King in His Exile] balances the poetic, the military, and the idea of performance. Geiger's father August is . . . poeticaly rendered . . . There is a lathe-like precision to Geiger's writing." "Geiger, a successful novelist in his native Austria, charts with considerable discernment not only his father's decline but the late-blooming closeness of their relationship—an intimacy that evolves due to the older man's increasing lack of inhibition and Geiger's own belated insight . . . Stefan Tobler's restrained translation captures the acuity and wit of the original; the interchangeable sorrow and playfulness of a mind that has gone beyond what Geiger describes as 'a fiction of our reason' into its own miasma of confusion and often terror . . . The mountain setting and obdurate protagonist bear striking similarities to fellow Austrian Robert Seethaler's international bestseller A Whole Life . . . Anyone who has ever witnessed a long-drawn out, inevitable death will recognize the combination of anguish and release, comfort and desolation, of helpless promises made in the face of a temporarily unnavigable future." "The unexpected delights of dementia: Yes, there are a few, according to Arno Geiger—including a wonderfully vivid and original way with words . . . Stefan Tobler's delicate translation renders it absorbingly readable . . . This is not an Alzheimer's handbook, but it does contain useful advice . . . Arno Geiger prefaces The Old King in His Exile with a quotation from Hokusai: 'You have to show what is most universal in a personal way.' In this tender, clear-eyed account he succeeds in doing exactly that." "The Old King in His Exile is as much a family story—focused on the figure of the father, from his healthy youth to his lost old age, as well as the son who writes this account—as a chronicle of disease, and Geiger strikes the right tone throughout the narrative, largely avoiding pity (self- or otherwise) and managing to present a warm and ultimately understanding portrait of his father. Despite the absurdity of the idea of any 'best,' given the situation, Geiger does make (and take) the best of these difficult circumstances.